← How Many Times Do I Have To Tell You? Don’t get me wrong—I don’t actually mind sitting at meetings that are roaming all over the place. Usually, I’m being paid good money to be there. But, too often, it is a poor use of my time. So, too, is it a poor use of time to have your development director get involved with things that are not related to fundraising. Now, truth to tell, there are many, many things that are fundraising related. Anything that reaches out to let people know about your organization can be a part of fundraising. Ditto anything that touches those who are already involved with your organization. But all these things must have a direction that leads toward asking someone to support the work you do. So when the water pipe leaks, that’s not something the development director needs to be involved with. Nor should he or she be asked to run every single event that occurs in or near your organization unless there is a clear connection between that event and the getting of charitable gifts. Likewise, there are things IN the development office that the director of development should not be tasked with doing. And yes, I understand that your organization might be small. Resources, if they exist, are slight. And yet, if you don’t let your development director (and remember, this word means “boss,” “leader,” “executive” and NOT “the person who does everything no one else wants to do”) focus on the very important business of increasing your charitable revenue, you will never be anything but small with slight resources. The problem, of course, is not always created from outside. Often, development directors are their own worst enemies. It can be more gratifying—or at least, less stressful—to spend your days entering gifts into the database and sending out thank you letters rather than to be calling on prospects to get an appointment to ask them for money. And busy work often gets in the way of the real thing. As does those meetings that meander and end, when they end, with no decisions having been made and no action items to do. A lot of my time is spent with organizations small and large, helping them to be more effective fundraising organizations. And while every organization is different, there are some universal truths. 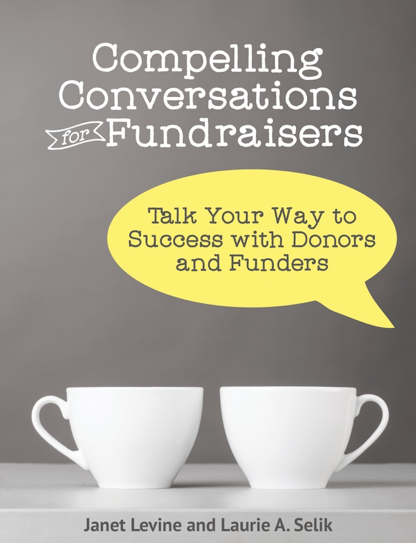 The first is that successful fundraising requires that you build a broad and diverse funding pool. That means that you are raising funds from many different groups of people in many different ways. The second truth is that not all ways of fundraising, or groups from whom you are raising these funds, are equal. We all know that at least 80% of the money you raise will come from no more than 20% of your donors—and yet too often, development directors spend all their time on the 80% who provide less than 20% of the dough. Do not misunderstand me—these donors are important. But if you are the only (or one of two) fundraisers on staff, you must be realistic about how much time you can afford to spend with them. This isn’t rocket science (as my husband, the rocket scientist—well, ok, the mechanical engineer—likes to remind me). If a group of people are providing 80% of your revenue, how much time do you think you should spend with that group? Bingo! Eighty or more percent. If you are a small organization, that means that you need to take some upfront time and really plan your annual giving program and make the part that deals with many smaller gifts pretty simple. But remember, “simple” does not mean unprofessional, sloppy, or anything less than something you would be proud to show your mother. It just means that you have a clear calendar, job descriptions for your volunteers, a training program for new volunteers, and a way to ensure that everything is staying on course. For some development directors, it will also mean letting go of a few things. When I was the chief development officer (and bottle washer) I learned to let go of the things that really didn’t bring in the money. So events—I’d spend my time on who was coming, how they would be treated and what the follow up was—and if I didn’t have a great volunteer committee, relied on the caterers to worry about menu, tablecloth and napkin colors, centerpieces. My direct mail campaign used really carefully crafted letters and reply devices that didn’t change very much from year to year. I operated (successfully I might add) on the theory that repetition is a good thing, and that while I hated to think that the words I spent so much time on (at the beginning!) were skimmed over, the truth was that mainly they were. I did, however, spend time on segmenting my lists—only in that way could I easily identify who was ready to be moved up a notch or two closer to that magic 20 percent. Not everyone made it, but I always want to give them a chance. Like many of you, I often had jobs where although I was the main fundraiser, fundraising wasn’t my only area of responsibility. Unsurprisingly, where I didn’t have a big chunk of time to spend with major prospects and donors, our fundraising efforts were not terribly successful. But when I could spend 80% of my time on the high worth 20%, fundraising results clearly showed the value of this strategy. Janet Levine is a consultant, coach and trainer who works with nonprofit and educational organizations, helping them to increase their fundraising capacity. Learn more about her, her workshops and her services at http://janetlevineconsulting.com. This entry was posted in development, fundraising, major gifts, time management and tagged 80/20 rule, fundraising, productivity, time management. Bookmark the permalink. I find your tips really useful. Poor management or prioritizing is leading many businesses (not only fundraising organizations) to the bottom nowadays. Nobody said it is easy to be an executive, but if you can not take the responsibilities and manage your time right, better look for something less responsible.